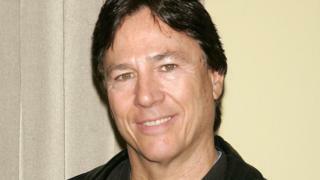 Tributes are being paid to actor Richard Hatch, who has died from pancreatic cancer at the age of 71. He was the only actor to appear in both the original series of Battlestar Galactica and its more recent reboot. Hatch played Captain Apollo in the original sci-fi series and a different character - Tom Zarek - in the reboot from 2004 to 2009. Star Trek actor George Takei wrote on Twitter: "Rest with the galactic stars, Richard Hatch." Ronald D Moore, who created the rebooted version of Battlestar Galactica, described Hatch as "a good man, a gracious man, and a consummate professional". "His passing is a heavy blow to the entire BSG family," Moore added. Hatch's son Paul confirmed his father's death in a message posted on the actor's website: "He died peacefully with his family and friends at his side after a battle with pancreatic cancer." Dave Prowse, who played Darth Vader in the original Star Wars trilogy, tweeted: "Very sad to hear about Richard Hatch #RIP #Apollo." Edward James Olmos, who starred in the Battlestar Galactica reboot, added: "Richard Hatch you made our universe a better place We love you for it. Rest In Peace my friend." Hatch's other acting work included an early role on All My Children in 1971 and appearances on Dynasty, The Love Boat, Santa Barbara and Baywatch.